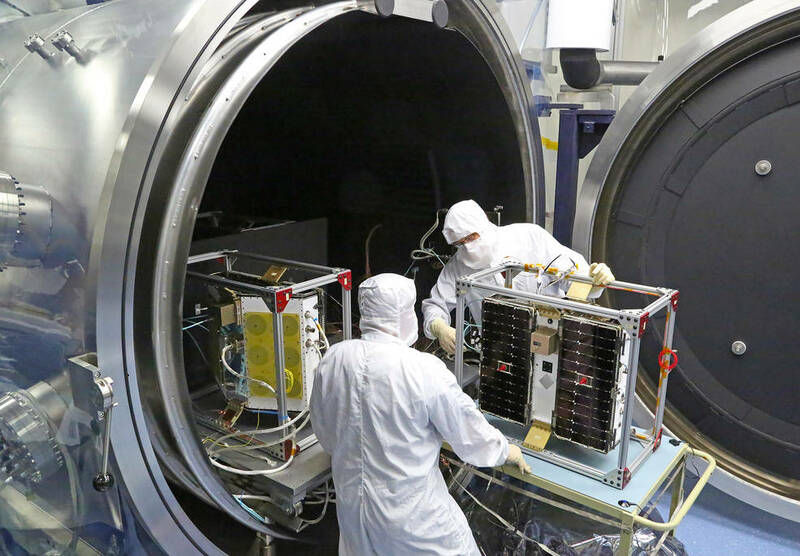 June 15, 2016 – NASA’s Cyclone Global Navigation Satellite System (CYGNSS) mission took another major step last month as the eight CYGNSS microsatellites successfully completed functional and environmental testing of their systems and software. The mission is on track for launch in late 2016. CYGNSS will probe the inner core of hurricanes in greater detail to better understand their rapid intensification. During the past few months, the CYGNSS observatories have undergone tests at the Southwest Research Institute in San Antonio, Texas. These tests simulated the harsh environments of space and launch, including separation and deployment, vibration, and electromagnetic interference. Additionally, all of the spacecraft were placed in a vacuum chamber and cycled through the extreme hot and cold temperatures they will face in orbit. With testing complete on the individual observatories, they will now be assembled into a flight stack — the final positioning for launch — for the concluding series of environmental tests. Sierra Nevada Corporation (SNC) is designing a deployment module for the mission, which is designed to carry all eight satellites on one launch vehicle. Upon completion, the observatories will be transported to Vandenberg Air Force Base for mating with the Pegasus launch vehicle just before the ferry flight to the Florida launch site. CYGNSS will launch in late 2016 from Cape Canaveral Air Force Station in Florida aboard a Pegasus XL rocket from an Orbital ATK Stargazer L-1011 aircraft. When the rocket gets to the right altitude, the SNC deployment module will start up and deploy pairs of satellites in opposite directions. The goal of CYGNSS is to improve hurricane intensity forecasts. The instrument aboard each of the eight CYGNSS spacecraft will measure surface winds in and near the inner core of hurricanes, including regions within the eye wall and intense inner rainbands that could not previously be measured from space. The CYGNSS-measured wind ﬁelds, when combined with precipitation ﬁelds from other satellites will provide coupled observations of moist atmospheric thermodynamics and ocean surface response, enabling new insights into hurricane inner core dynamics and energetics.